Today’s collection is prepared for those who appreciate real beauty and harmony. It includes a hand-picked bundle of readymade designs devoted to cosmetics and makeup artists, beauty and spa salons, nail art and lash design, hair styling and skin care services. You will find a lot of themes that come with WooCommerce functionality, so you can use them to create online stores and sell your beauty related products on the Web. A gorgeous WordPress theme suitable for makeup artists, cosmetics providers, cosmetologists, stylists, fashion experts, etc. The theme is quite suitable for creating an online store based on Shopify eCommerce platform. It includes Kirki ultimate toolkit for theme developers that use WordPress Customizer. It allows to design beautiful and meaningful UI just by abstracting the code. Of course the template comes integrated with an intuitive WPBakery page builder plugin which allows to create unique layouts just dragging and dropping the elements. Much more features and plugins are also available. 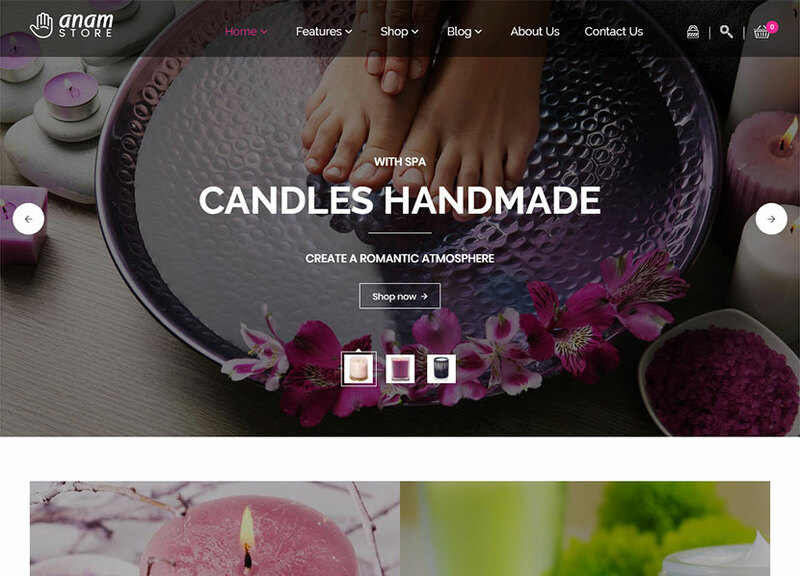 A cool WooCommerce WordPress theme perfectly suitable for spa and beauty niche. You can take it for creating an online store to sell equipment and cosmetics for spa salons, beauty salons, hairdressers, makeup artists, etc. 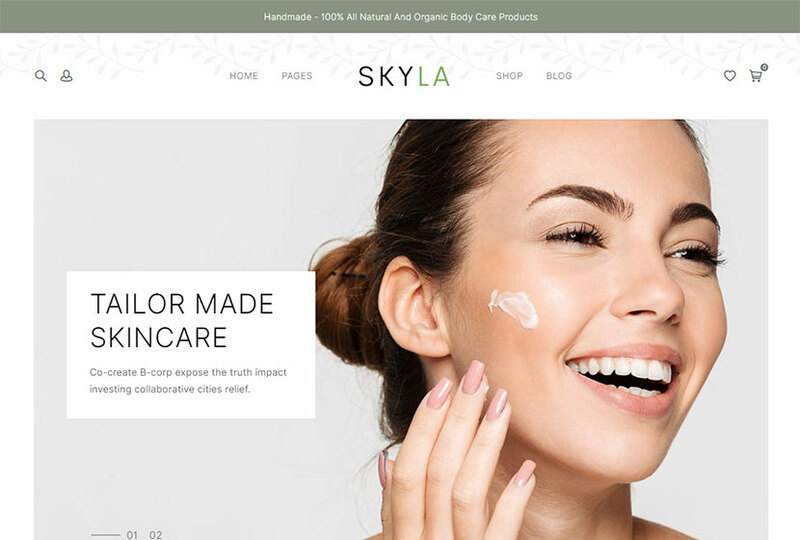 The template comes with 3 different homepage layouts for cosmetics, soap and bodycare shops, multiple options in WordPress Live Customizer, unique design, additional pages for a single product, shop, shopping cart, about us, blog, portfolio, and more. It also comes with many more advantages, so check it out. 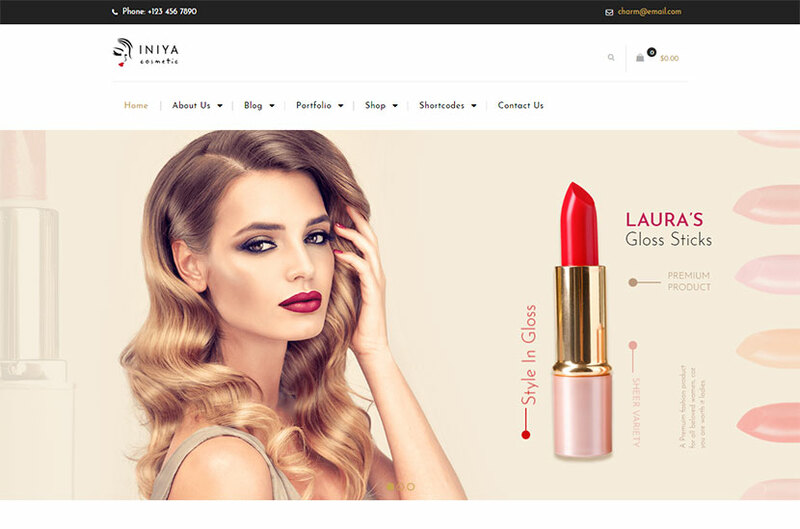 A beauty shop WordPress theme for creating a fashion and cosmetics related eCommerce store. You can use it to sell perfumes, cosmetics, clothes, accessories, shoes, and other related products. The template includes 7 homepages, powerful admin panel, WPBakery page builder, WPML-ready multilingual support, Contact Form 7, MailChimp, Revolution Slider, mega menu, options product slider, daily deal module, quick view, product image gallery, and many more features. A health spa and cosmetic WordPress theme made for massage salons, wellness spa centers, beauty resorts, cosmetology services and other related beauty businesses. The template is fully integrated with WooCommerce, you can sell your any products including some equipment for skin treatment, decorative cosmetics, expendable materials, etc. It also has a drag-and-drop element page builder, header and footer custom design, multi menu style, custom main color, post formats variety, and many more features included into the pack. A WordPress theme specialized in selling organic products including cosmetics, food, nutritional food, nutritional drinks, etc. This is a great template you can use either for distributing your self-made products or for selling them as a dealer of a well-known company. Except for all required online store functionality, the theme comes with WPML support which allows to create a global multilingual website, Redux framework with powerful options, mega menu, multiple homepage layouts, sample background images, unlimited custom sidebars, boxed and fullwidth layouts, a lot of blog layouts, and many more features. A dermatology and cosmetic center WordPress theme that would match your projects in the health and beauty industry. You can choose it for dermatology clinic, cosmetology, skin care, hair styling, nails care, plastic surgery, laser surgery, spa, wellness, massage, and other related businesses. The theme boasts professional design, Slider Revolution and Swiper Slider included, interactive ajax search, boxed and fullwidth layouts, WPBakery page builder integrated, more than 20 post animations, user and main menu support, advanced blog settings, powerful theme framework, custom shortcodes and widgets, more than 750 Customizer options, and many more cool features. 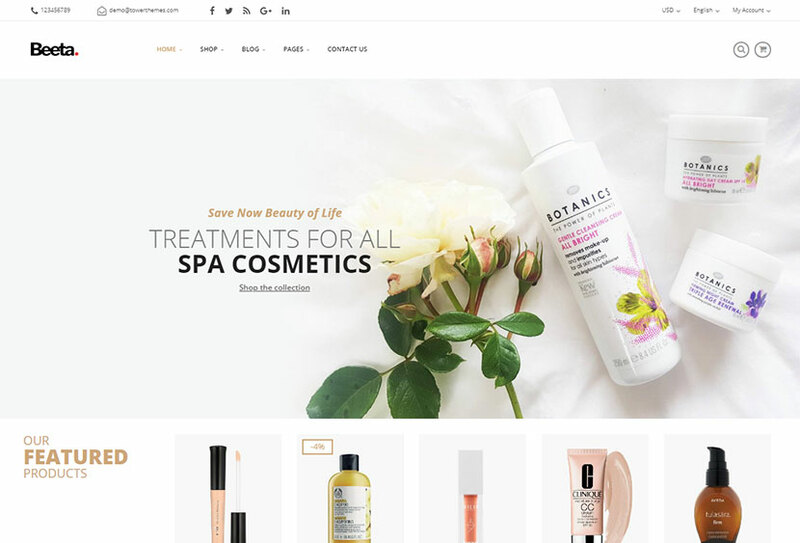 A beauty store WooCommerce WordPress theme designed for spas, salons and cosmetic stores or businesses to showcase their makeup, cosmetics and all related items. The template is made with experience, engagement and conversion in mind. 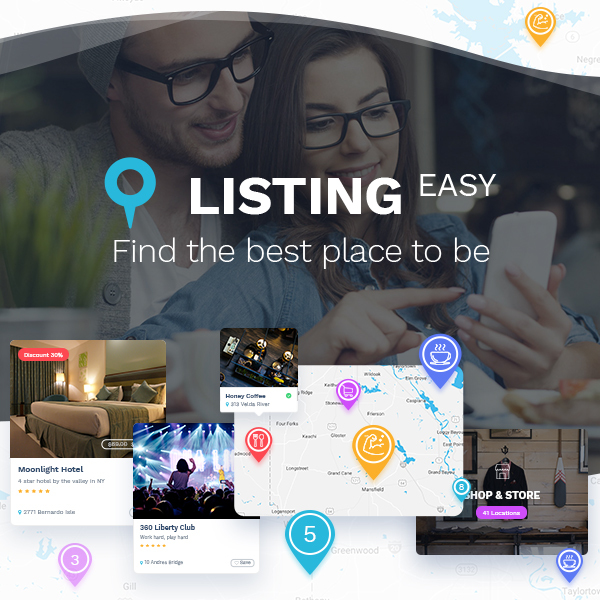 It comes with a number of cool features including mega menu, product slider, smart cart, flexible layouts, magic navigation, sticky headers, smart search, multilingual support, Redux framework options, compare and wishlist, quick view, and many more features both concerning the shopping functionality and the theme’s customization possibilities. 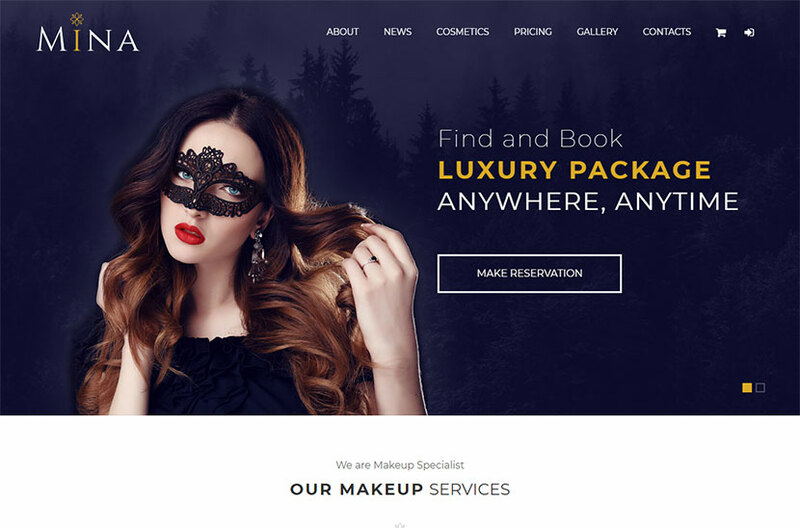 A beauty related WooCommerce WordPress theme available for makeup artists, spa salons, hair styling experts, cosmetics providers and dealers, as well as other related professionals and establishments. 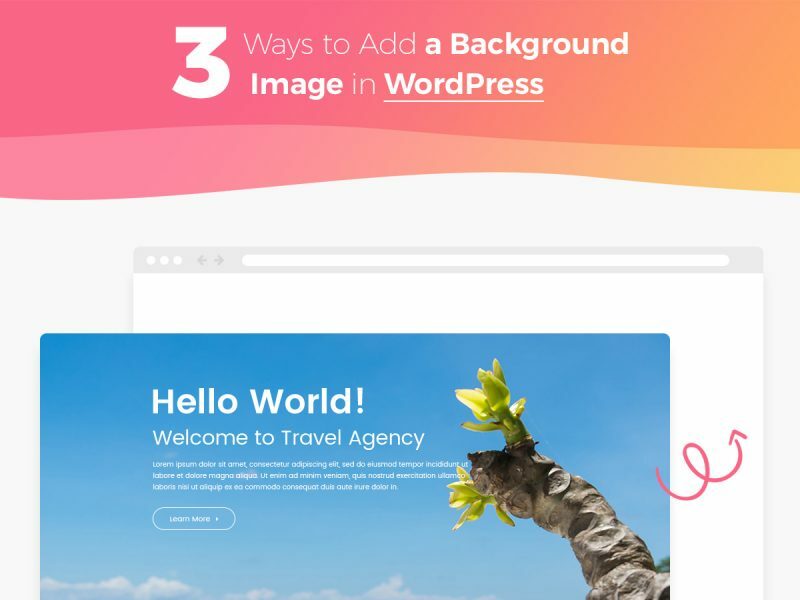 The template is fully compatible with WPBakery drag-and-drop page builder which helps to create unique layouts even if you’ve got no coding knowledge. Revolution Slider is also included into the pack to allow for creating beautiful showcases on any page. By the way, the theme includes mega menu, 4+ homepage layouts, powerful admin panel, and many more features. 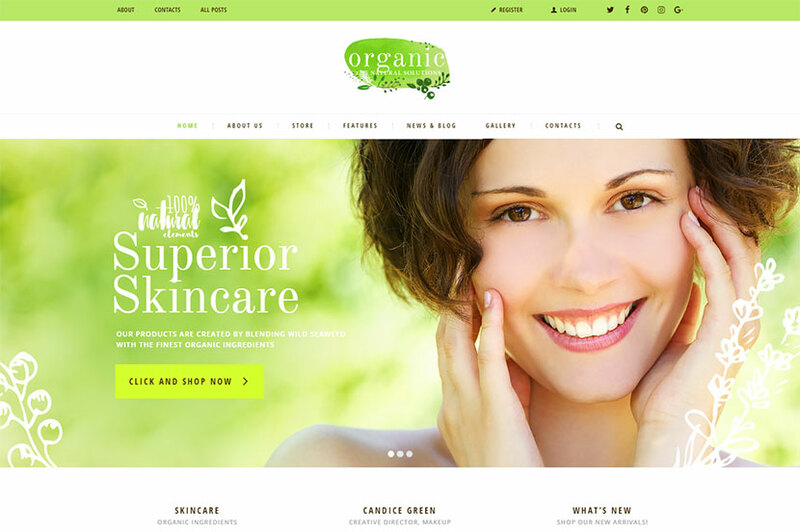 A splendid WordPress theme perfectly suitable for organic beauty stores, shops of natural cosmetics and organic skin care treatments. 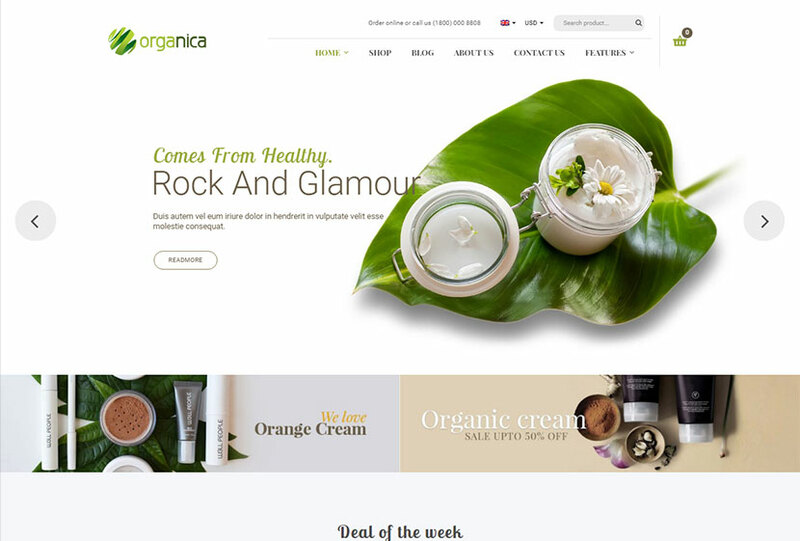 Any other organic products are also possible to present with the help of this theme. The template has an intuitive visual interface and informative layout that looks wonderful on any platform. By the way, it comes compatible with WooCommerce plugin, and it has full shop design integration, so you can easily build a store selling organic cosmetics or food with the help of this template. Navigation options, an integrated page builder, powerful framework, and many more features are also available. 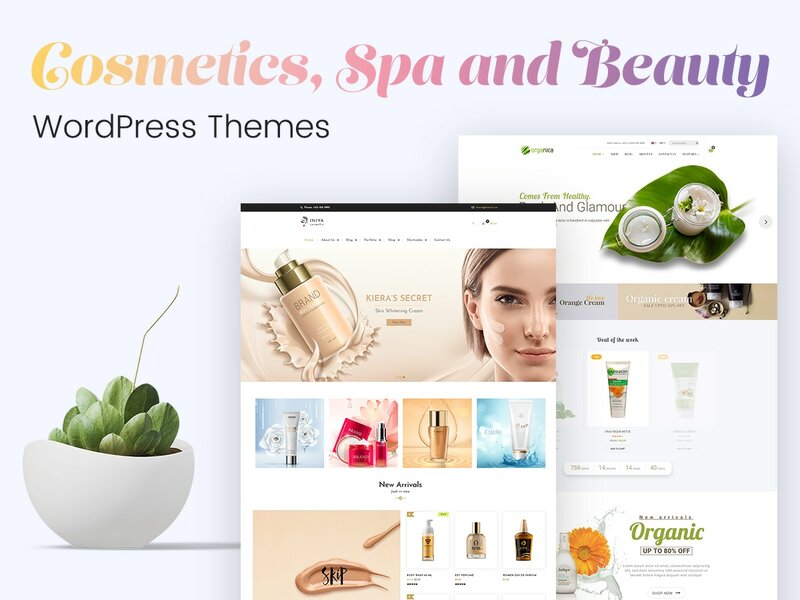 A premium WordPress theme designed for all types of cosmetics and beauty related websites including salon, wellness and spa center, beauty shop, etc. If you run a massage salon, hot tub, day spa or other related businesses, this theme also has you covered. It comes with many great features including WooCommerce support, WPBakery page builder for creating an unlimited number of beautiful pages, multiple gorgeous home pages, and over a dozen of inner pages for your eCommerce business. Mailchimp compatibility, Contact Form 7, and many more features are also included. 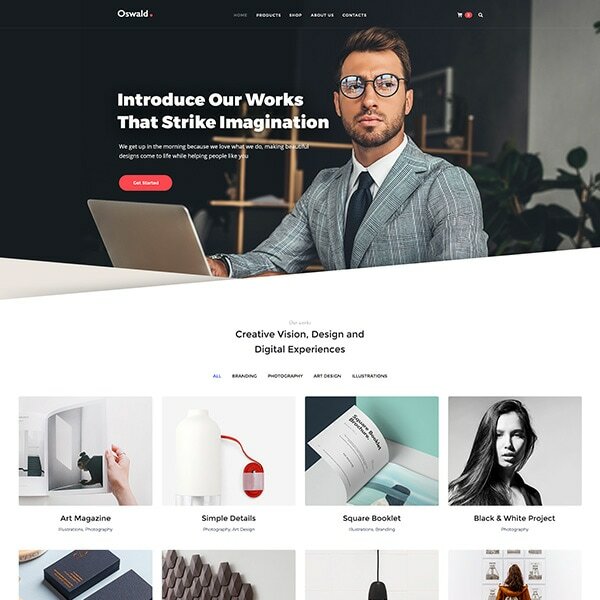 A modern and fresh WP template suitable for beauty salon, makeup artist agency, hairdresser, dermatology clinic, lashes studio, nail art studio, massage salon, or any other beauty and cosmetics related website. 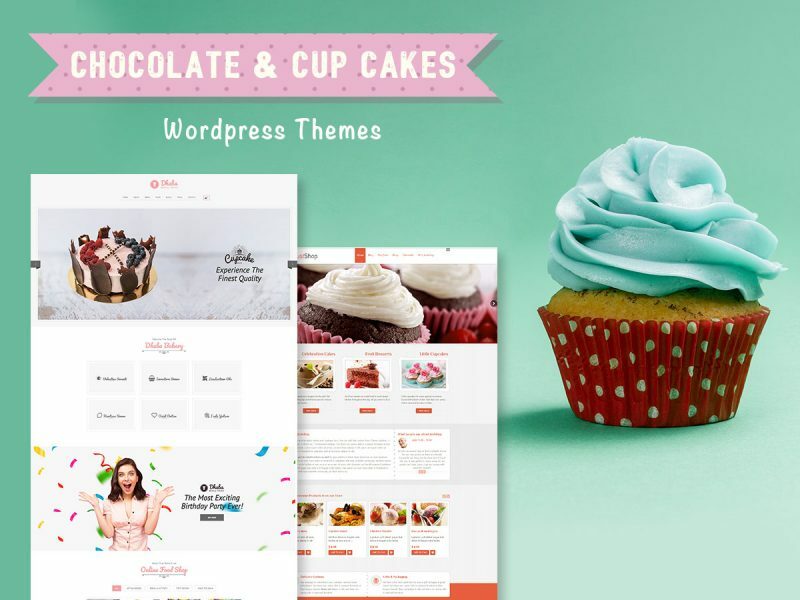 This theme will serve your business in the best way. It includes pricing, service package, booking schedule, service detail, about us, contact us, blog page, and some more pre-made layouts. Of course the template includes online booking system, so your customers can book appointments online very easily and quickly. Register and login functionality allows to create and enter clients accounts from the front-end. A trendy and minimal blog WP theme which can suit for beauty bloggers and other people who need to tell the stories online. It allows you be as creative as possible while building your professionally looking online diary. The theme comes with 3 different header styles, and each of them looks differently and brings different awesome impressions to the users. In addition, the template has a lot of cool features which include WooCommerce support, great animations, filterable portfolio section, social media sharing, jQuery effects and script, HTML version of the theme, and many more surprising advantages. 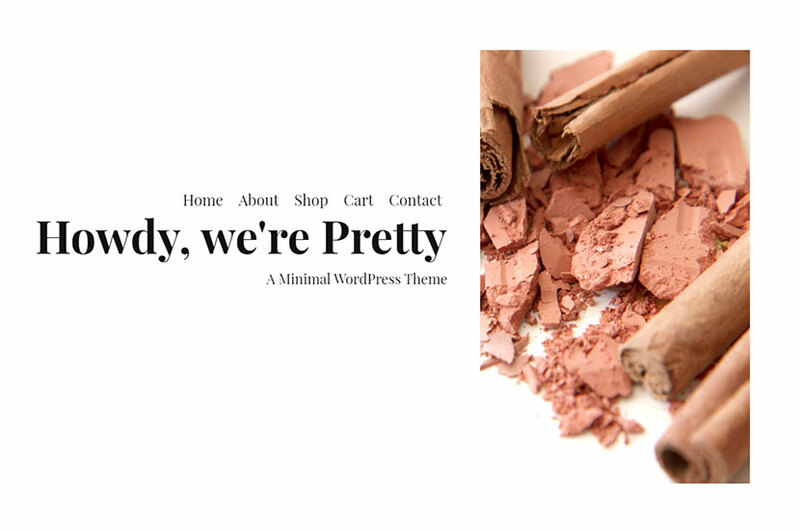 A WordPress theme perfect for makeup artists, beauticians, hairdressers, cosmetics stores and other beauty businesses. It is available both for individual experts and a team of professionals working with clients in the clinics or salons. The theme includes a bunch of pre-designed pages and custom shortcodes that can be added and removed easily to let you create a truly personal website. It also has WPBakery page builder as well as Revolution Slider premium plugins integrated, so you both save your costs and get new customization and editing possibilities while creating your pages. Check out much more of the theme’s features now. A multi-concept WordPress WooCommerce theme quite suited for selling perfumes, jewelry, cosmetics, accessories, handmade goods, fashion clothes, and much more related products. The template is designed with stylish modern and clean design to bring high aesthetics to your website. It also comes with powerful admin panel, WPBakery page builder with Ultimate Addons, Slider Revolution integrated, WPML support, mega menu, ajax booking, multiple layout options for blog, unlimited color settings, and many more features. Beauty comes from inside, so be always healthy and happy to feel beautiful and shine!